Meet Milk-chan, the weirdest superheroine you've probably ever seen. Be warned: she may look cute, but she's no poster girl! She may not have super powers, but she's rude, crude, and doesn't give you-know-what about what you think about her drooling. Living six months behind on rent with an obsolete robot, a slug, and an out-of-control pet, Milk-chan answers whenever the President calls...if she feels like it. The President's clueless, her missions are insane...but then the bad guys are nuts and so for that matter is our "heroine". The world is screwed...and it doesn't care. Welcome to The Super Milk-chan Show . 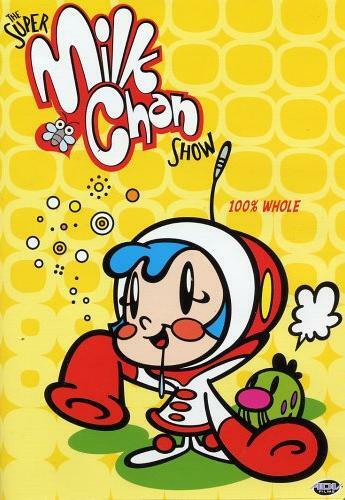 Super Milk-chan got its start as a segment in the Fuji Television show Flyer back in 1998. Its 14 episode original run developed a bit of a cult following, which precipitated Milk graduating from training pants to her own television show. When A.D. Vision acquired the rights to Oh! Super Milk-chan , they and Industrial Smoke & Mirrors (the dub studio upon whom ADV frequently relies) proceeded to do a little work on it. Since it's only two baby steps away from the average American animated crude comedy (ie. South Park ), they made the jokes and plotline fit better to American tastes. The original version of the show also had live action footage. They decided to replace them with behind-the-scenes skits from within Industrial Smoke & Mirrors. They also inserted the original 8-minute Super Milk-chan segments from Flyer into the show as Vintage Milk-chan . But to be fair to the purists, ADV made sure to keep the original footage. The Super Milk-chan Show is packaged with two discs per volume. One is the aforementioned "Made for America" version; the other is the original Japanese version. Just remember, keep the kids away from this. It may look cute, but it's cute in a Ren & Stimpy sort of way, with the language out of South Park thrown in for good measure.